Hello and welcome to Webcomic Wednesday! Each week I take a look at a webcomic and let you know what I think about it. This week I’m taking a more local route and checking out Moth City, a digital comic from Wellington based creator Tim Gibson. I’m guessing that probably ninety percent of my comics are purchased digitally through the Comixology app. In much the same way that my gaming library is mainly composed of Steam-bought titles, my comics library is very much relegated to my iPad. Despite the popularity of the app – Comixology regularly boasts as being the top grossing for in-app purchases- very few companies make interesting use of the format itself outside of a few examples (last year’s AvX: Infinite series is one example). Tim Gibson’s webcomic Moth City not only embraces the digital realm as a means of distribution, but capitalises on the possibilities that print comics cannot. In short, Moth City is an evolution of the comic form. Moth City very rarely remains static. Panels often shift and change; eyes will move, lights will flicker. It even allows the reader to focus on the image at times before the speech bubbles appear. It’s not only an economy of space – each panel allows for more than one action to take place – but it looks stylish as well. It feels more akin to a motion comic, except it lets the reader move at their own pace. Alongside the motion, the building of the page panel-by-panel as you click lets the story feel like you are watching a film. Gibson appears to direct the action – at certain points only a small part of the panel will be shown before it expands out to show the bigger picture. It gives more freedom for storytelling, rather than filling the page with clutter with panels showing a step-by-step, it allows for more information in one panel to be taken in. It lets the reader focus on what’s important before pulling back to show the big picture. Use of digital format aside, Moth City is a great read. A noir crime drama set on a Chinese island in the 1930’s, it moves at a brisk pace, full of suspense and action. 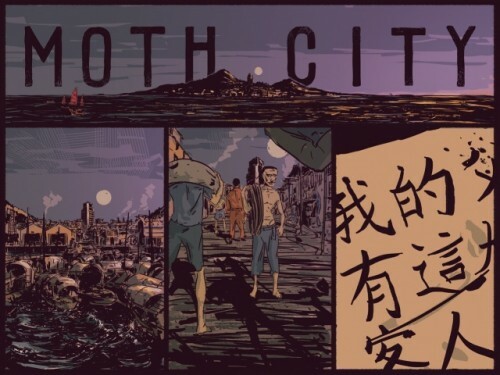 Almost at the end of it’s first “season”, Moth City is building towards an exciting finale, injecting equal parts mystery and horror into the latter half. The art is strong, with a dark colour palette that compliments the tone of the story. Despite the changing nature of panels, Gibson takes into careful consideration how the action should show, like the lights dimming over a character, and this attention to detail is a treat to see. Moth City knows its unique format, and moves to work with it. Like I mentioned before, Moth City is nearing the end of its first season next Monday, and you should definitely check it out before then. It’s the evolution of an art form, showing the potential of digital comics has, and it’s an exciting future. It’s updated every Tuesday and Thursday NZ time, and you can check it out here.